The natural inclination when you lose your job is to tighten your belt and reduce your spending. Nights are more typically spent lying awake figuring out how to make ends meet -- not looking for ways to part with your last remaining disposable dollars. It will make you look really smart and tech-savvy, Gallant says. A website is nice too, but far less important than your email address. Make sure that's the email address on the business cards you order (see above). Price: About $50, or less on godaddy.com. That's where the people who can hire you will be at. 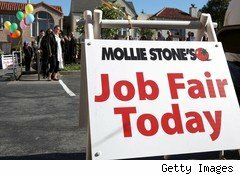 At a jobs fair, the only people you're going to meet are other unemployed people. You want to go where the decision-makers are. If you're an unemployed lawyer, you should consider buying a ticket to the $100-a-plate dinner to meet the other lawyers there. Price: varied. Look in the mirror. Do you need a haircut? A style that will make you look younger and more dynamic? You will get one chance to make a first impression and you can't blow it in any way. Taking care of your appearance, especially at a time when you feel more like crawling through the day in your pajamas, can't be overstated. You just don't know who you will run into at the market. Price of a professional salon cut: $60 and up. Coaches have sprung up in this recession the way mushrooms do on an over-watered lawn. And for that alone, caution needs to be taken before you part with your cash. Coaches come in all shapes and forms -- lifestyle coach, motivational coach, spiritual coach, relationship coach and my personal favorite, a success coach. Truth is, talking to some coaches is about as helpful as talking to a friend. And you don't pay your friends to listen to you, do you? Not to state the obvious, but you want someone who is smarter than you to be your coach. You want someone who can look at how you have approached your job search and see the holes in your strategy. Any coach will give you a complimentary 30-minute session, said Gallant. Make sure they have the knowledge, experience and track record with people like you before you make any commitment, she said. And 30 minutes is long enough to know whether you click with them. A coaching relationship shouldn't be open-ended. At hourly rates of about $200, chose wisely and remember: It makes no sense to pay for advice and then not take it.